School was previously on Commerce Street. The house on Lawrence Street stands on a lot having 64 feet fronting on Lawrence Street, extending back about 67 feet, then widening to 110 feet and extending back, making the entire depth 182 feet. The cost of the site was $37,7000. The contractors for building the house were Moses T. Baker, mason, Messrs. Wm. H. Kirk & Co., carpenters, and Thomas Stent, architect. The building, furniture and improvements cost about $48,000. The building will seat comfortably 725 scholars. In the year 1856, a Primary School was organized for this ward (Fourth Ward) and located in the second story of a building on the corner of Mulberry and N. Canal Streets, with 125 pupils. No play grounds but the street. In the spring of 1860, the school was removed to the second story of a building o the corner of Market Street and the alley leading to the Commerce Street lot, where it remained until Sept. 1860, when it was transferred to the new brick house erected in the rear of the Commerce Street lot. 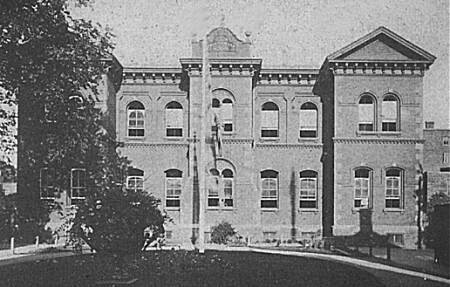 This building was two stories, with one large class room on each floor; it was subsequently enlarged to double the original capacity by putting an extension on the north end. From this location it was removed with the Grammar School in Sept. 1873 to the first story of the new house on Lawrence Street where there are ample accommodations.